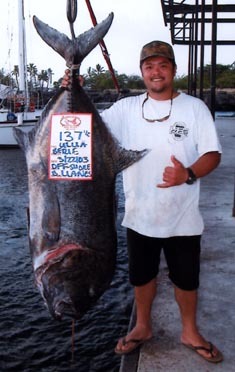 Bernie Llanes is a shorecaster with a history of catching monster giant trevally. He has already placed three 100-plus-lb ulua in the 100-Plus Club and this, his fourth, is his biggest so far at 137.5 lbs. He caught the fish using a half-and-half bamboo pole that he'd made, a Daiwa Sealine 6/0 reel filled with Suffix Titanium line (100-lb test) and a 3-lb frozen octopus. Bernie battled the fish for over an hour and thought it was a large ray or perhaps a big shark until he saw the silver sides of the fish reflected in the light of his brother Brian's light.